He had grown tired of home. He knew what it was like, and it was no longer enough. Every day, freedom walked past the gate, and it looked amazing. He saw others free to do as they pleased with no consequence. He saw freedom from rules and watchful eyes. He saw a chance. And he took it. The world suddenly seemed so big with new sights, sounds, and smells. He could not tell if those shouting at him were angry, happy, or just excited by the freedom. This offered so much more than what he had imagined, and it was not long before he looked, smelled, and sounded like everyone else. It was a loud life. So loud, in fact, that he quickly forgot those once-familiar voices. Suddenly, he was caught around the shoulders. “Hey, you should stay with me,” she told him. “I will keep you safe.” He did for a while, but it started to feel like home, that place he longed to forget. So he left. This went on longer than he had planned on. Ducking into loud sounds, dark places, and something that no longer felt like freedom. He grew tired, thirsty, and even a bit tired. He did not want to admit it, but he wanted just a bit of what he had at home. A little safety. A little food. A little bit of peace to rest his head. But how would he even get there? Would they even want him back? Without warning, he was taken by the shoulders again. This time he could not break the grip even though he tried. And he was taken to a place a lot like home. And yet not even close. He was given food, water, and a place to rest. But nothing more. He heard voices that sounded familiar and yet none that he recognized. He had longed for freedom and found a prison. If he remembered how to cry, he would have. Instead he just wished for home as he tried to sleep. The next day he heard a voice. He knew that voice. The voice was looking at him and told the captors, “He is mine.” Then the voice went away. What he did not realize was that his freedom had come with a price. There was now a debt that he could not pay, but it had to be paid in order to go home. With tears of happiness, the voice paid his debt. Released from his cell, he went toward the voice with caution. What would be said? He was a mess. He smelled of awful choices. He knew he had run from home, but now he wanted nothing else but to be there. But could he? Who have I just described? A story from the Bible? My runaway dog of last week? Or maybe have I described you? I know this much: I have described me. I never pictured myself as s prodigal, a lost son, nor someone in need of rescue. I was good, or at least good enough. I grew up going to church, whether I wanted to or not. I memorized verses for stickers of stars. I had Christian teachers, friends, and family. I even had Christian jobs. But then what? In my anger against Christians, I refused to even give them the chance to be what I wanted them to be. I was looking for a Church – people who loved Jesus, would give freely of what they had, and unconcerned with titles, walls, and empires. I wanted to find Kingdom folk. And I wanted them to help people – just as long as it wasn’t me. I didn’t need it. It’s not hard to become hardened. One person or place treats us wrong and we start to protect ourselves. We move away from them. We build our own walls around ourselves and call it freedom. And when we hear familiar voices, we convince ourselves that they wouldn’t want us back anyway. We never seem to run back to grace. We tiptoe toward it. But grace runs, throws open arms around us, holds us tight, and showers us with tears of joy. Grace only wants us to know that our debt was freely paid at great cost – just to bring us home. I did describe a story out of the Bible. Jesus gave us a picture of a father running to embrace the son that had returned home broke and broken. And a great celebration took place. The lost had been found! It did not matter that the lost had become that way on their own terms. None of that mattered. I did describe my dogs. My stinky, silly, runaway dogs. I did describe me. When my lost dogs were found, they became very expensive to bring home. I went broke and broken before people that I knew and said, “I need you.” I don’t do that well. I’m not sure I’ve done that before. And people gave freely to me. No concern for titles. From all walks they gave. Even after I said I had enough, they gave. Why? To be a part of a grace celebration. I was overwhelmed. Tears flooded my face because I realized that I was home. I realized that I do know the Church and it knows me. And we celebrated that the lost were found. But most of them probably didn’t know that I felt found. Or maybe they did. And maybe I have described you. Life has made you hardened, a little isolated, and a lot skeptical. People hurt and are hurting so don’t let them too close. You feel familiar inside your tiny wall of freedom and don’t believe anything else will have you. Or maybe love and grace doesn’t feel free. Maybe you think that at some point you will be given a bill to pay. So why bother? A few years ago I prayed a prayer that I said too quickly: “Help me love more deeply.” Before the end of the night, I was chasing a runaway child through dark streets. I only wanted her to be safe. I wanted her to have the chance for things to be right. But she kept running. We love because we are crafted in the image of God, the One who IS love. It comes at a price. Not a price to pass along to you, but a price paid just to bring you home. Celebrations await. I’m learning. Not only was I angry that the church was not the Church, I was also foolish enough to think people should ask for help even though I don’t. I broke. I could not do it on my own. And I see that now. I didn’t know what to do the extra grace. To keep it almost felt selfish. Little did I know that I would find someone hungry and in need of food. I found someone in need of shelter and could help them find it. I found someone in need of transportation and was able to help. Not because of me. This all happened because of the celebration. When I was welcomed home, the celebration was more than what was needed. Others could come and they did. Maybe you need a celebration too. You can tiptoe back home and be welcomed with loving arms. God’s love is deep. God’s love is wide. And it’s waiting to embrace you. 48 hours ago, you should have asked me this riddle: “How can an empty space of 10 inches by 20 inches quickly cost you more than $500?” I would have been puzzled for hours before deciding that you were either paying to advertise nothing, or you were paying to hear a politican speak for 10 minutes. I would have been wrong. The answer would be that an eleveated gap between a gate and my deck railing would be exactly what my dogs would use to escape, and the cost would be my reclaim fee from the shelter. If you would have followed up by asking me, “How will you have more than enough for the cost?” I would have again been puzzled and finally guessed that the wind had blown someone’s winning lottery ticket into my yard. Again, no. But that is what has happened. I don’t believe in coincidence. I believe in confirmation. The difference is in our eyes, not the event. God is always speaking, working, and moving. Whether or not it is noticed is in our eyes and our hearts. Writing is a tough gig. Unless you are handing in an assignment to a teacher, you often do not know who will read it. Even less so will you know the impact or the thoughts of the reader. I’ve been writing since I was 10 years old. The audience started out as me, and it remained that way for many, many years. At times I would share a piece or a poem with someone, but mostly I was the audience. A few years ago, while having breakfast with a good friend of mine, I was challenged about how I used my writing. “Our gifts are not ours to hold on to,” he told me. “God wants to use those gifts to bless others.” He was right. In fact, the idea of “blessed to be a blessing” goes all the way back to God’s promise to Abram. Making the descendants of Abraham (once God changed his name) to number more than the grains of sand or the stars in the sky was not a gift that Abraham could possibly see in his lifetime. But God blessed Abraham so that others could be blessed. Maybe. You have cake, and it is more than enough. But it was given to you. Suppose that you refuse the offer, knowing that you will not be able to eat all of the cake but no one had said anything about feeding the hungry. Person after person comes up to you with offers. One has knives. One has forks. One has chairs. One has a table. One has wine. One has cups. One has shelter. One has a guitar to play music. And yet you refuse them all. This is YOUR cake! They all walk away hungry. And you are so busy refusing to share that you have failed to notice a line of ants has crawled up your legs, down your sleeves, and on to the cake. Now you too, will walk away hungry. I don’t know your thoughts on God nor your heart. But I firmly believe this happens all of the time. What is mine is mine, and that means it is not yours. 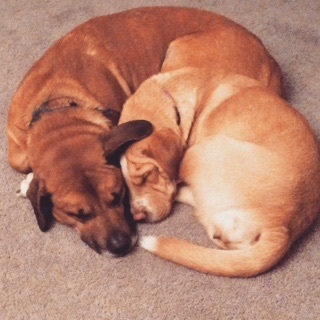 In the last day, people have given in an incredibly generous way to help me reclaim my dogs. I asked through a written piece. I have never had such a response to anything I have written. But you know what happened first? Pain. Loss. Heart ache. And then an admission of my helplessness. There was absolutely no way for me to pay the fee by myself and waiting would only make it higher and more impossible. That also happens all the time. We run from God’s protective care. We become lost. Endangered. Hungry. Hurting. Messy. Captured. And unable to pay our way back to the relationship we once knew. God carved out a small space in the Garden of Eden. He said to Adam and Eve, all of this is yours, but not that fruit. It was not a matter of poison. It was not a matter of tempting Adam and Eve. The question at the root of it all was a matter of the heart. God had given them everything they needed. Was that enough? Or did they want more and were they willing to disobey to have what they thought they needed? You know the answer. They wanted more cake. God created us in His image and that includes being free of will to love. Being willing to stay in God’s love gives you peace. It will also allow you to receive more than you ever need. Do you know what would have happened if you had said “Yes” to all those who asked about your blessing – your cake? You all would have had a celebration! And that, my friends, is God’s design. You have been blessed. How will you freely choose to love and bless others? I have always found it easier to give to those in need than to admit my need and receive. I assure you that it is not because of my nobility. It is because of my pride. I have tried and tried to earn God’s love. Instead of the celebration I could have been having by others blessing me, I’ve received the rote gratitude given to those who did what was asked of them in the first place. It is as if a teacher asked the students to sing a song, and I started singing louder and more off-key than everyone else. Not because I loved singing, but because I wanted the teacher’s approval. I did not harmonize. So what’s the point? People have given beyond what I asked today. I’m floored. I’ve never experienced anything like this. I received an anonymous gift and desperately wanted to know who it was. But does it matter? Am I going to try to settle the score and pay them back, or am I going to dance and eat cake at the celebration? God has given us all that we need and more. But it is not in our hands alone. A fork alone will leave you hungry. And, if you believe what I wrote above, even a cake alone will leave you hungry. The first thing we must do is realize that God does not stop giving. God’s character does not change. God IS love so it is not completely accurate to only say, “Yes, God loved me then.” God loved you when He put the cake in your hands, but that was only what you noticed. God is always about the business of loving you because that is who He is! If you believe that, the celebration needs that you next accept that you already have more than what you need. Why? Because that is how God works. We are made in God’s image. God is relational and interdependent in a way we cannot begin to comprehend. God’s fullness is found in that God is Father, Son, and Holy Spirit. God was in relationship before we were made. This is significant, because we can otherwise believe that God made us in order to be in relationship with Him. That would suggest that God needed us in order to be complete. That is the type of belief that leads to my pride and belief that I can work this life thing out on my own. It also completely obliterates the fact that we are made in God’s image because God loves. And, in God’s image, we will love. You are blessed. You are loved. You have more than what you need. And yet, you don’t have all that you could have. Today I received gifts I never, ever expected. But I was broke(n). If I didn’t accept that and admit my helplessness, I would be broken-er. I don’t know the position of those who gave, how much they have or how this affects them. I just know that they realized that there could be a celebration and they wanted for us to be a part of it together. That sounds like God to me. I want you to know that you are loved. And I want you to know that you need more than the cake you hold on to so tightly. You cannot have a celebration all by yourself, and you cannot bless others if you only offer empty words, “I pray that you find some (different) cake!” Receive. Give. Celebrate. Love. All of those words describe my day today. I pray that they will describe yours as well. 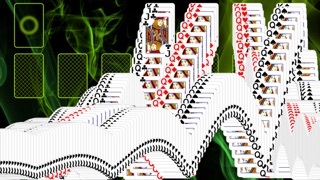 If you have ever played the game of FreeCell, you know how satisfying this image can be. You make move after move until everything falls into place and then you watch as the cards cascade down to tell you that you’ve won. If you are like me, you would sometimes wait on moves that could be made just so you could watch it all come together. Ahhhhhh! Here is the next part of the story. People have generously responded in a way beyond what I could ask and have given enough money so that I can reclaim my lost-but-found dogs. Praise the Lord! Lord willing, I will bring them home tomorrow. It’s a bit beyond this post to explain all of the threads that I see in the people who gave. But here are some of the pieces: a beloved friend, a prayer warrior, another friend, and another friend, and even someone who gave to me anonymously as “Just someone who cares” have met the need that I asked for in humility. One part of that was an envelope of money someone received, she felt, unnecesarily, and was “sitting in a drawer waiting for a cause.” You don’t always have to know why you’re doing something: in the hands of God, it will all come together. I have had a little bit of rest, but I was still exhausted. I decided to take a risk. I called my brand-new boss and told him I would not be coming in for my fifth day of training tonight. Having already given them 44 hours in 4 days and another 12 looming, I knew it could wreck me. I did not ask him. I told him. Those of you who know me at all know how out of character that is for me. I’ve been chastised for my failure to say “No” since I was 20 years old. I had a supervisor tell me that the way I operate would eventually leave me prone to a stroke. If I could, I would. Tonight I said, “I shouldn’t and I won’t.” Some people do that well. This is new to me. I was risking being told that my first full-time job in nine months would be removed from me, leaving me with no income stream. God is good. I was heard. My boss agreed. More importantly, we established that I could and would be a four-day, full-time employee going forward. I can provide for my family and yet be available to my family. The female dog who ran from home was never supposed to be ours. We inherited Tink, if you will. This part is important. She first belonged to RJ. RJ bought Tink as her Christmas present to herself in 2013. When RJ went to work, we watched Tink. That collar in the picture is still hers today. When RJ decided to make the difficult decision to move away and take steps for college, she asked if we would keep Tink. And obviously we did. I was blown away that someone I knew had been a person put in position to come across and protect my lost dogs. Wow. I started to think about how long it has been since I’ve seen or talked to Sam. “About two years,” I thought. Wait a minute. What’s the date today? On August 13, 2013, I walked away from the place where I worked with Sam. I had affirmed to my supervisor that I was allowing RJ to live with me in a spare room that I had available. RJ had run away from a supervised living location and was still technically a ward of the state. Both of her parents had their rights terminated. Within the child and welfare system, she was abused, abandoned, and mistreated. The courts had legally revoked the parental rights of her adoptive parents, but left RJ’s twin sisters in the care of the adoptive parents. What did this mean? It meant that RJ had no more legal rights to contact her younger twin sisters. That was the first conversation I ever had to have with RJ. Essentially, your sisters are dead to you. Ahh, Tiff. She had come so far from when she used to call me the “white devil” six years before that night. The next two days I helped Tiff find a local program that could house her and help her. But that meant I missed a large, two-day training for work. 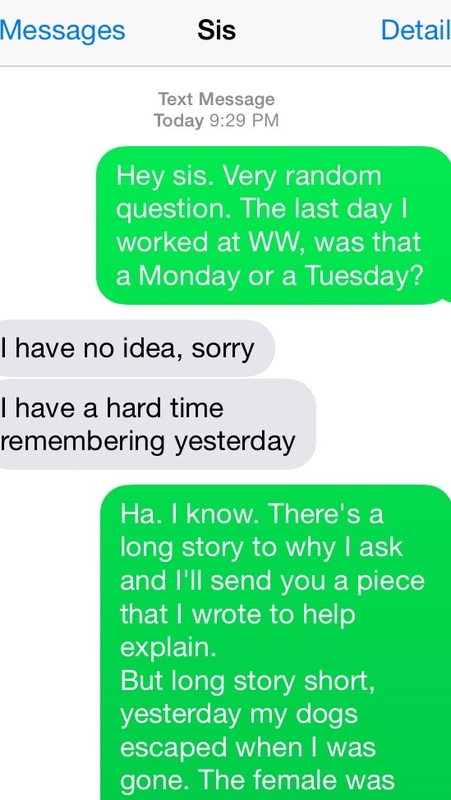 My supervisor had to explain my absence to her supervisor. Red flags and caution everywhere. Now my supervisor was in jeopardy because of my actions. On August 13, 2013, I returned to work and acknowledged my actions. I offered my resignation and went home. I received a phone call from an administrator asking me to return and turn myself in. Essentially, they attempted to have me arrested. They investigated. They called the local police. The case worker inappropriately requested a show cause hearing to demand my arrest. My friend and attorney spent all day with me as we went to a court room three hours away. After multiple hearings, there was only mine. All involved retreated to the judge’s chambers. All except for me. I sat in my seat, silent. I have never defended my actions to any of the organizations involved. Not a word. And none of their charges against me ever stuck. They had nothing. Why? God was honoring my trust in Him by defending me. In fact, the organization decided to fire me and then refused and challenged to provide unemployment. I did not receive a penny. At some point I requested an appeal. I did not receive notice, but there was a hearing on December 15, 2014. It states that my phone number, the same number I have had for years, was disconnected. Again, not a word from me. The end result of the hearing? I had “violated a prohibition that is universally observed,” BUT, the agency failed to file their appeal in a timely manner and had no good cause for that. According to the law, I was absolutely wrong. Yet somehow I was free and given a victory. According to the law, the agency was absolutely right. Yet they lost. God is holy AND just. And loving. But we sin. We’re wrong. And the law says we should die. Yet, somehow, we can be free and given a victory. Yesterday, my friend Sam saw a helpless situation, it broke her heart, and she intervened. She gave shelter and protection and love as long as she could. Then she released them and allowed God to work. Sam had held RJ’s dog one block away from home, but had no idea how Tink might get home. And who is RJ? RJ had come to me with a helpless situation, it broke my heart, and I intervened. I believed that her staying with me, even briefly, would be safer for her than the alternative. I gave shelter, protection, and love as long as I could. Then I released her and allowed God to work. I had no idea how RJ might have a home again. God knew. Almost there. 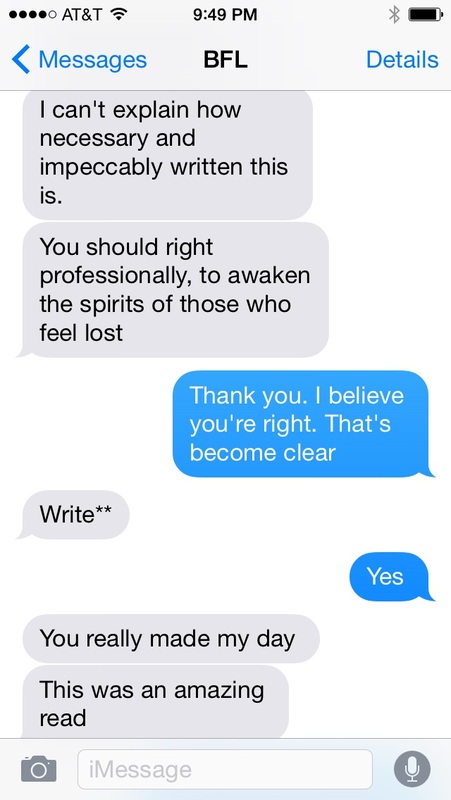 Look at the way I started a text to a dear friend of mine. On August 13, 2013, before I met with my supervisor, Sis told me that I could get into serious trouble for what I had done. I told her, “I know. But I’ll be okay.” We were both right. I haven’t seen Sis since that day. As I sat down to write this, I was given an alert. WordPress wanted me to know my site was “booming.” I assure you, it’s not because of me. That’s God. There’s more. Look at the message I received from a friend today after sharing an earlier post with her. There’s more. 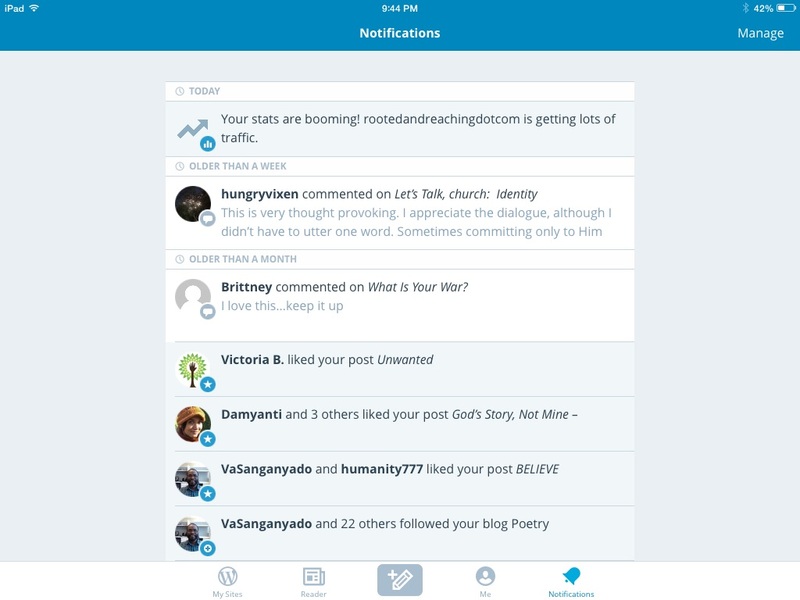 Look at what I saw when I opened WordPress. 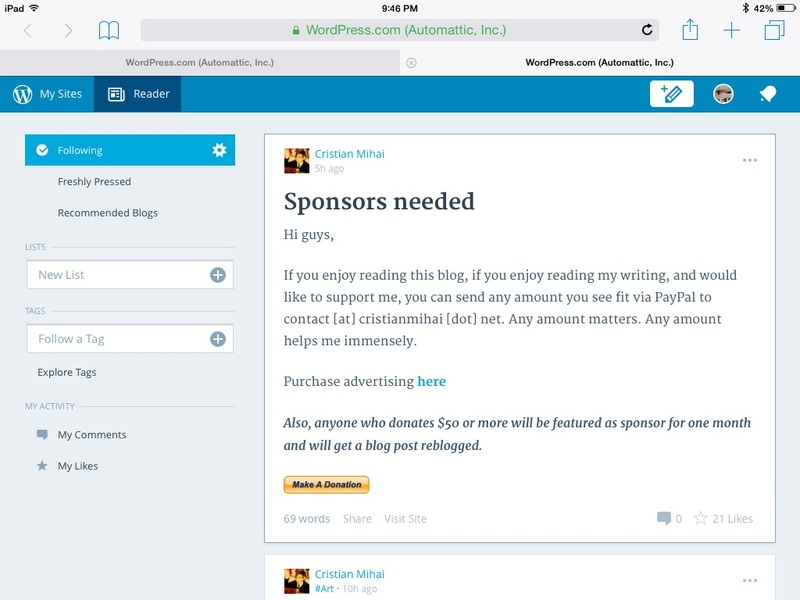 I don’t know what it means to “write professionally.” I’ve never thought about asking for money to support my writing. But if today has shown me anything, I should ask and receive. I will continue writing. And if you would like to support me as I do that, I will offer you the information so that you can do so. If you use PayPal, I can receive your gifts via the email address of rootedandreaching@yahoo.com. If you are still reading this, I should probably pay you. But if you feel it upon your heart, you may give. And I will not refuse. I almost did. In the midst of this piece, I received a message that someone had read my post and wanted to cover the entire cost for my dogs. That’s a problem. The cost is already covered. What should I do? My first answer was to refuse. The response was then to simply give an amount that I needed now. I stopped. I changed course. I said that I would receive the gift. Here’s why. The cross on my wall? 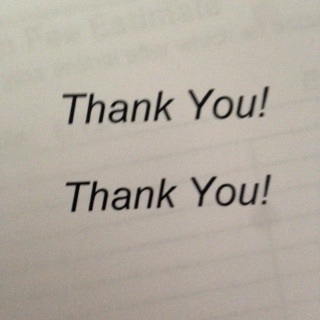 The words of “Thank you” below it? Jolene DeHeer speaks all over and always used to turn down words of “Thank you.” She didn’t need that. Then it was pointed out to her how rude it was of her to refuse the gift of kind words. She should receive them as if they were flowers. 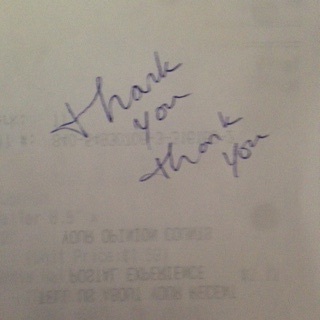 Say, “Thank you very much” and receive them. But then, at the end of the day, all praise and honor belongs to God. So she figuratively places her flower “Thank you”s at the foot of the cross. I took that example to heart, and that is why I have the cross on my wall. Please don’t refuse God’s love and grace. Let it cascade all over you when it all comes together. I used to think it was okay to have a “brother / sister” relationship. That I could protect myself as needed. That thought was like the fence for my dogs. It had a gap that left my heart open to potential dangers. I have had this conversation with my friend, and I think my fence needs reinforcements. I do, however, agree with Shane Claiborne that no one is truly “fatherless.” We do, however, come across many brothers and sisters who need us to come alongside and help them know their Father. You know, like a church with a building. Help restore those relationships. Speaking of that, I am now three days from an unfortunate anniversary. I will be divorced for nine years. I don’t want to be divorced anymore. I want to speak with God’s authority that He can powerfully speak through a restored marriage. After my last sermon as a chaplain, my supervisor told me that my voice had changed. I was speaking truth in love with authority. In everything that happened, I lost my voice. The overwhelming response to my plea for help today as I shared the truth is a humbling comfort to me. God, please cascade over me with your love and your grace. Last week I wrote a letter and started it with “A letter to my wife.” I want her back. I want to have a lifetime of placing “Thank you”s at the foot of the cross for what God has done, is doing, and will do. I believe that God will honor my trust in Him. He always does. When the Lost are FOUND! Nothing went right yesterday. Well, nothing went as I had planned or expected. I was finishing up my third day of training on a new job. The job is a route sales position that operates primarily in third shift, so my body was adjusting to this new lack of regular sleep. Just before 9am, I received a message from my sons that our two adult dogs escaped out of the fence, bolting down the street and out of sight. 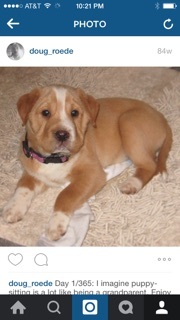 Their puppy, left behind, was described to me as “paronoid” (sic). I felt the same way. Having just worked 12 hours through the night, I neither had the energy nor the calm demeanor to handle this. I knew they would be out of sight by the time I had a chance to search. They were. I drove up and down streets nearby with no sign of them. I shared via facebook and a community message board and attempted to get to sleep. I’m happy to report that today, after another 12-hour day, I was able to stop by the county animal shelter and find that both of our dogs are safe and sound! I could stop there or go on to thank all of the people who helped share the message that the dogs were lost. But there is something much deeper here that I absolutely could not miss and have to share. Just have to. I’ll try to be as brief and clear as possible. Given my two hours of sleep in the past 40 hours, wish me luck. The dogs had escaped a fence. I did not install the fence to punish them. My love for them set the boundary, encouraging them to stay with me where they would be safe, loved, and cared for. My male dog did not always see it as love. He wanted freedom. But I know better. If he runs free, he could go unfed. He could experience harm. He could cause harm. I set the boundary out of love. Yesterday when he escaped, he experienced freedom. And for the first time, our female dog followed him. But they were no longer protected. They happened to be discovered not terribly far from home, but they could not get home by themselves. They were lost. And now that they have been found, they can come home. But there is a price to be paid before they can return to the love that wanted them close. A steep price. And I want to make a jump here to something that may seem incredibly strange at first, but bear with me. God loves you. The boundaries around you are out of love, not to punish you. God will protect you, but stepping into something that looks and smells like freedom can leave you unprotected. You could be harmed, you could cause harm, and you may even be leading someone else into that same risk. But God seeks you. He wants you home because He loves you. And God will pay the price to reclaim you. 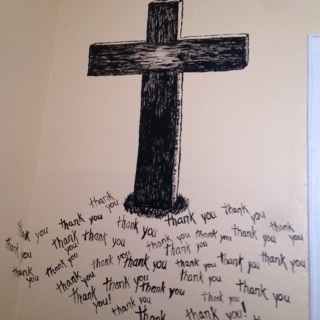 I recently resumed a daily habit of painting a “thank you” under a picture of a cross on the wall of my bedroom. It was a habit I had learned about placing any praise or gratitude that we receive at the foot of the cross. What has been remarkable, is that lately every day when I have done this, God has provided something unexpected for me. I’ve been financially strapped without a full-time job for over nine months. Some of that was by choice as I pursued a degree in ministry, but I had suddenly found renewed meaning in praying for daily bread. But things I no longer needed sold on craigslist, books sold on Amazon, and all at the strangest times. I’ll take bold step and admit that by the end of July this year, the grand total of my income has been $60. But every bill has been paid, no meal has been missed, and God’s provision has been astounding. I have even been able to help with frantic calls for grocery money, a phone replacement, gas money to get home after being stranded, and bus money to get somewhere safe. I was only the vessel. God made a way. Now please follow this next part closely. Two times for the two days. I worked twelve hours. I pushed off my new boss’s request to keep me longer so that I could go and check for my dogs. I found them, safe but scared, in separate kennels at the shelter. I was asked to give proof that they belonged to me and I wanted to ask if my tired and relived tears were enough. Instead I showed a picture which confirmed what she had already witnessed: I knew them and they knew my voice. Then came the news of the cost to reclaim them and bring them home: $492. Beloved, I cannot make this stuff up. Let me add one more detail before I wrap this up. Yesterday I wrote this status on facebook: “When I am in one, I don’t especially care for a day that I know will become a sermon. Not even if it makes a good point. Just sayin.” In other words, I knew God was up to something, but I had no idea what. Now I do. So here’s my sermon. Yesterday friends and strangers helped spread the word that I needed help. And if that was you, I pointed this piece out to you so that you or someone you know can hear this: God loves you. He wants to keep you close out of love, not a punishment. He knows you will find freedom in His love for you. And if you have run away, done things you shouldn’t have and now regret, if you are lost and cannot find your way home, there is good news. God seeks, knows you, and comes for you. You will know Him when you see Him. You will know His voice. And He will point to you and tell the one who has locked you up and imprisoned you, “That one there: she is mine. And he is mine. I’m taking them home.” And the one who locked you up will add up the cost of what you have done. The rules you didn’t follow, the fact that you had not been stamped and sealed as God’s, all of that will add up. And God will say, “I know. I paid that price.” The life, death, and resurrection of Jesus was not for a good story. It was a real life with a real cost out of real love. I know this was only about lost dogs, but it really wasn’t. If you read this far, it was for you. You need to know – today – just how much God loves you. Hear that voice. Know His love. Be safe and protected once again. And what about me? What was the whole point that I should hear? I can’t do this on my own. I’m not in control. I need grace. I need help. It was the greatest of humility and gentle boldness that I admit I need your help. Our dogs are still locked up until I can pay the price. I’m asking for your help if you are able. I looked into ways I could raise funds and pay them and the fastest way would be if you would be so kind as to send what you can by moneygram. If you do, simply use my name as Douglas Roede for the receiver. I am in Michigan. And you will receive a reference number that I will need. You cold send that, along with the amount of your gift, to douglasjroede@gmail.com or to 6162092446. I am in tears to even ask this, but God has made His point. I cannot do this walk of life alone. I shouldn’t even try. I need grace. I need love. I need someone willing to pay the cost. If you read this, thank you. If you shared this, thank you. All I really want you to know is that God loves you. And somehow He used my silly, runaway dogs to have me tell you that today.